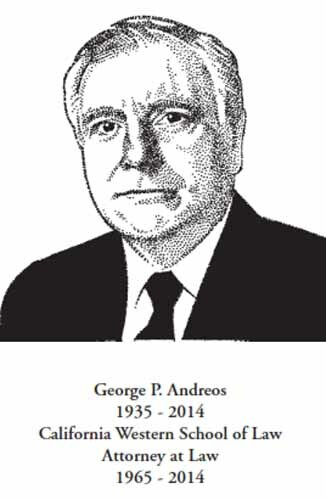 George P. Andreos was born January 20, 1935 in Chicago, Illinois. He received an undergraduate degree from the University of Illinois; served in the U.S. Marine Corps for three years obtaining the rank of Captain. He obtained his juris doctorate in 1965 from California Western School of Law. Thereafter, he held the Presidency position with the California Western Law School Alumni Association. He was very involved in the legal community. George began his legal career in the City Attorney’s Office. George served as President for San Diego Trial Lawyers Association in 1981 and President of the San Diego County Bar Association in 1991. In 1982 he was honored as "Outstanding Trial Lawyer" by the San Diego Trial Lawyers Association. He was inducted into the San Diego Trial Lawyers' Hall of Fame in September 2006. He was a frequent speaker at seminars sponsored by many associations and organizations. During his legal practice, George primarily specialized in personal injury, wrongful death, fraud, negligence, business litigation, professional negligence, and probate litigation. George was a resident of Poway for 38 years. He was very active within the Poway community. He served on the Poway Business Advisory Committee for the Poway Center for the Performing Arts, sponsored numerous youth sports teams, was involved with 4-H, and performed with the Poway community theatre. George loved playing 4-wall handball with his friends on a weekly basis. He participated in many tournaments including the Marine Corps Annual Tournament in San Diego. He enjoyed outdoor activities such as attending to his produce groves, sporting events, snow skiing, camping and hiking. At the age of 72, he climbed Mt. Whitney reaching the summit of 14,500 feet. George is survived by his wife, Beverly of 48 years, four children, three in-laws, and seven grandchildren.